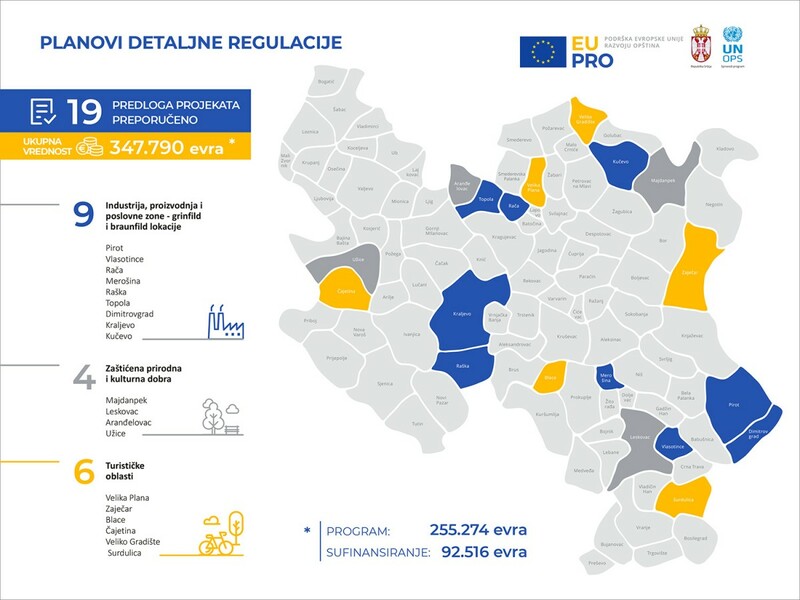 The European Union, through EU PRO development Programme, will support with the amount of 255,274 Euros the development of detailed regulation plans in 19 local self-governments in the region of Šumadija and Western Serbia, and the region of Southern and Eastern Serbia, with the aim of improving local conditions for attracting investments. Out of 28 applications submitted for the Public Call open from 25 April to 11 June 2018, 19 have been approved for funding. The projects include formulation of detailed regulation plans covering the areas that have the potential for generating economic activities, such as greenfield and brownfield locations, tourist areas and protected natural and cultural assets. In nine local self-governments, Dimitrovgrad, Kraljevo, Kučevo, Merošina, Pirot, Rača, Raška, Topola, and Vlasotince, the projects of developing detailed regulation plans refer to improving conditions and public infrastructure in industrial, production and commercial zones. Six projects to be realised in Blace, Čajetina, Surdulica, Velika Plana, Veliko Gradište, and Zaječar should contribute to creation of conditions for developing tourism areas, while the projects in Aranđelovac, Leskovac, Majdanpek, and Užice will enable the valorisation of protected natural and cultural assets. 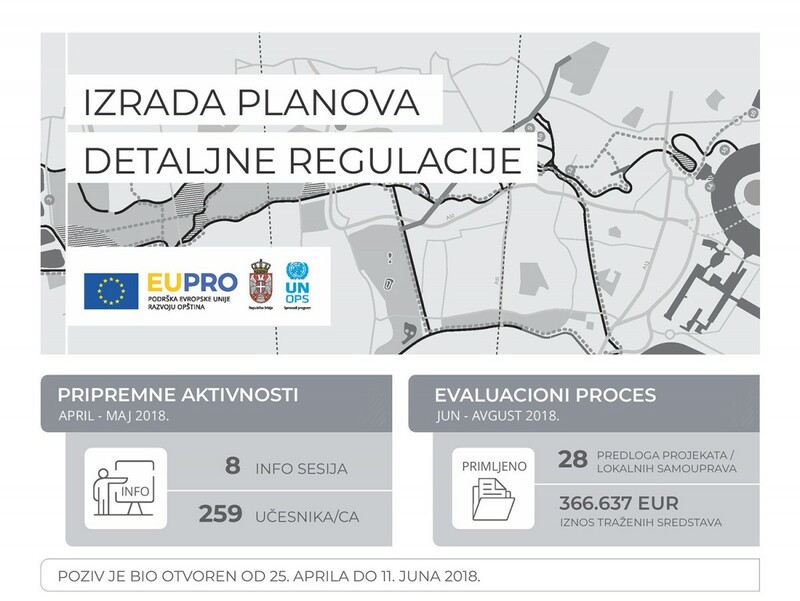 Moreover, through the work on the formulation of the plans, the local self-governments should meet additional requirements introduced by EU PRO,in line with the applicable legal framework, in order to improve the quality and implementation of the plans, including the mandatory formulation of Strategic Environmental Impact Assessment. The list of approved projects is available on the Programme website here. Local self-governments where the projects will be realised: Aranđelovac, Blace, Čajetina, Dimitrovgrad, Kraljevo, Kučevo,Leskovac, Majdanpek, Merošina, Pirot, Rača, Raška, Surdulica, Topola, Užice, Velika Plana, Veliko Gradište, Vlasotince, and Zaječar.